NASA scientists exploring the dark side of the moon have revealed an ideal location for a permanent base on the rock. New research from one of the space agency’s Lunar Reconnaissance Orbiter has finally unveiled the mysteries of the shadowy side of the moon. Investigating the two poles in perpetual darkness, the Lyman Alpha Mapping Project (LAMP) found the presence of water frost and porous surfaces. And after examining the Cabeus crater, researchers discovered the presence of hydrogen, mercury and other volatile gases which are ejected along with water from the crater’s soil. Finding water at these new locations has increased scientists’ understanding of the satellite’s water system, which could be harnessed to provide clean drinking water for future moon inhabitants. Co-author Dr Kurt Retherford, a senior research scientist also in SwRI’s Space Science and Engineering Division, said despite the promising results there is still more to discover. 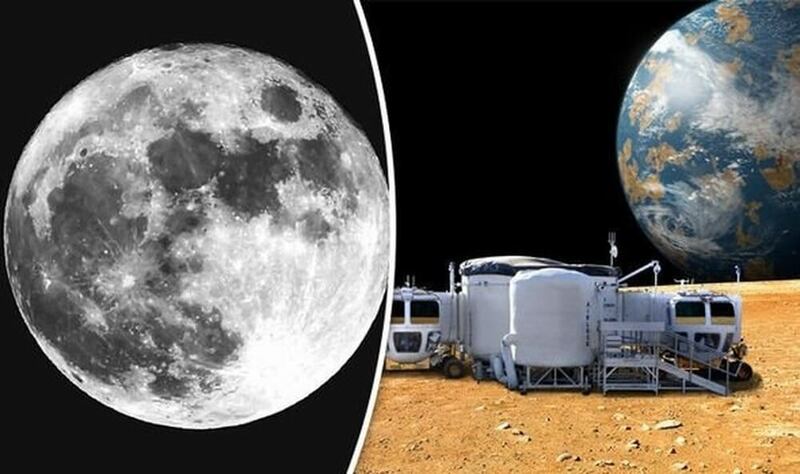 He said: “The permanently shadowed regions of the Moon are revealing themselves to be some of the most exotic places in the solar system, well worthy of future exploration. The presence of water frost makes it an ideal location to set up a permanent moon base in the future, said Mr Rutherford. Sometimes called the far side of the moon, it refers to the side of the satellite which is unable to be viewed from earth. Always facing away from the planet, the majority of the unobservable surface was first glimpsed by humans in 1959 when a Soviet probe managed to photograph it. No humans have ever ventured to the dark side, but over the years as advancements in technology few it was revealed that the mysterious hemisphere was littered with craters. One of the largest craters in the entire solar system, the South Pole-Aitken basin, is located on the shadowy side. In 1969 the first humans, Neil Armstrong and Buzz Aldrin, set foot on the moon after the successful Apollo 11 mission.